My first dairy-free attempt for panna cotta came after I found a recipe here. It was pretty good ; I made it twice and served it with my own version of a naturally sweet, yet sugar-free strawberry coulis. Some time later at my workplace we celebrated the end of the school year and our chef made the real thing, with real cream. I am gluten intolerant but because of my husband usually do not eat dairy. However on this particular occasion I indulged and started wishing for a creamier version of the vegan panna cotta. So I did. And we liked it : the panna cotta was now smooth and creamy, without the disastrous side effects that milk / cream has on his health ! – 200 ml non dairy cream, such as soy cream or almond cream, but NOT almond “butter”! 1. 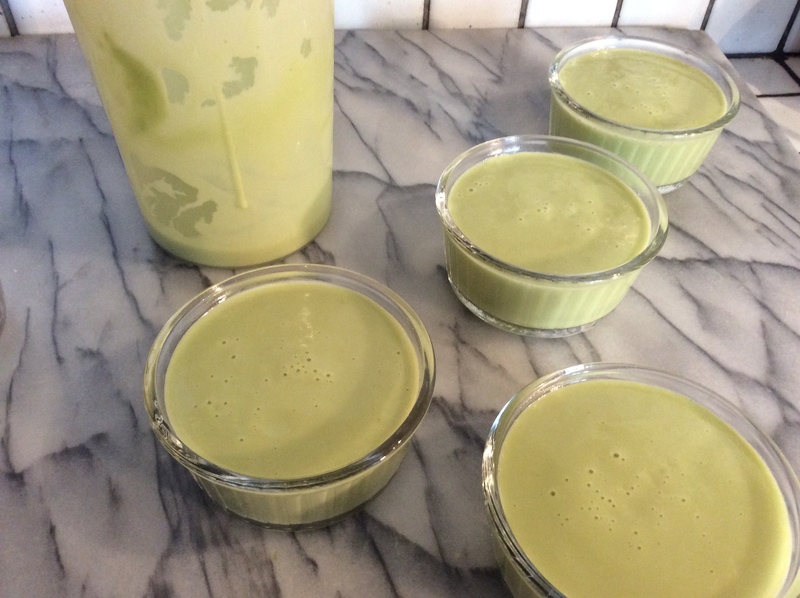 In a small saucepan, combine the agar agar powder with a little almond milk. When it is well mixed, gradually add the rest of the liquid. Do not add the powder to the liquid after it has been warmed, it will make lumps which are almost impossible to get rid of, trust me on this. 2. Add the agave nectar and bring to a slight boil, stirring. Lower the heat and let simmer between 1 and 2 minutes. 4. Pour into 4 ramekins, let cool down before refridgerating until set. At serving time, just blend the strawberries with the dates. Ta-dah ! Nothing to it ! 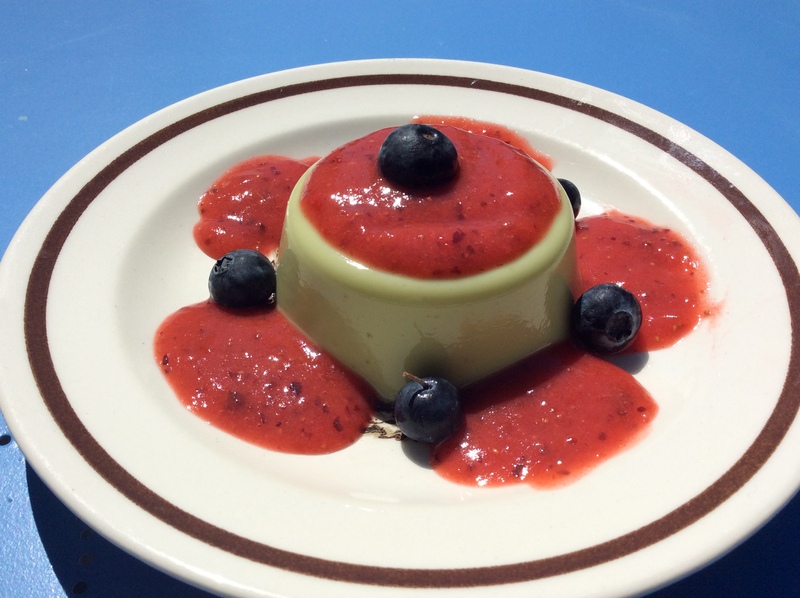 Gently unmold the panna cotta onto dessert plates (I use the blade of a knife which I insert between the panna cotta and the edge of the ramequin), pour the coulis over, and decorate with some blueberries. To be enjoyed in the privacy of your backyard ! Wow – spectacular! I can’t wait to try and gather these ingredients together and give this a try… You’re English is absolutely perfect – I am so impressed! How fabulous! Now I don’t feel quite so bad about my school girl French not being advanced.. hehe..